On Tuesday 13 March 2018, Asialink co-convened the ASEAN-Australia Dialogue: Partnering for Security & Prosperity in Uncertain Times, in close collaboration with 10 other institutions around Australia. The Dialogue was held as part of the lead-up to the Australian Government’s ‘ASEAN-Australia Special Summit’. The Dialogue was supported by the Department of Foreign Affairs and Trade and the Australia-ASEAN Council. Discussion on the day covered contemporary multilateral issues, including shared economic, security and political challenges and opportunities facing ASEAN and Australia. Below is a summary of Asialink’s activities in the Dialogue. Asialink Group CEO Jenny McGregor opened the ASEAN-Australia Dialogue, thanking participants and encouraging all to delve beneath the surface and listen to our ASEAN partners on issues of mutual concern. I would like to acknowledge the traditional custodians of the land on which we meet today, the Gadigal people of the Eora nation, and pay my respects to elders, past, present and emerging. This ASEAN-Australia Dialogue is a collaboration of 11 institutions: University of Tasmania, Griffith University, Australian National University, University of Sydney, University of Western Australia, University of Melbourne, AusCSCAP and our host PwC with support from DFAT and the Australia-ASEAN Council. We are grateful for the generous hospitality of PwC and for the part Professor John Blaxland has played in chairing the organising committee. We are especially grateful for the participation of our eminent speakers and experts from ASEAN – many of whom are long standing colleagues and friends. This inaugural Prime Minister’s Special Summit around which we meet is shining a powerful light on ASEAN for Australia and on ASEAN-Australia relations. This week is ASEAN-Australia week and the reach and impact of the activities supported by DFAT and the Australia-ASEAN Council is, I think, unprecedented. There are school programs, arts collaborations, social entrepreneurs and joint training. We have sports people, media, civil society and business forums all coming together to solve shared challenges often in innovative modes. There is a code-a-thon to work on counter terrorism and cybersecurity and ASEAN business forums being live streamed around Australian capital cities and regional centres. I believe we have never before had so many diverse Australian eyes and hearts and minds on ASEAN. We are also encouraged by the bipartisan commitment to Australia-ASEAN relations, as seen in the Labor Party’s FutureAsia policy speech which saw the Australia-ASEAN relationship as vital and this upcoming Summit as a catalyst for a new phase. Today from the Australian side we’re committed to doing what we are often criticised for not doing enough of – listening. Asialink has been delighted to be part of this Dialogue. We are delivering 5 of the 18 programs of ASEAN-Australia Week and have a long record of supporting the important role of ASEAN in an overall Australia-Asia strategy. His Royal Highness Sultan Nazrin Muizzuddin Shah, the Sultan of Perak, Malaysia delivered the keynote address at the ASEAN-Australia Dialogue 2018, at Asialink’s invitation. Sultan Nazrin was introduced by Jenny McGregor, who explained that he is at present Deputy King of Malaysia as well as Sultan of Perak. He has been a prominent speaker on ASEAN issues and his international activities include serving as co-Chair of the United Nations High-Level Panel on Humanitarian Financing. He is Chancellor of the University of Malaya and Royal Fellow of the Institute of Strategic and International Studies, Malaysia. For more complete biodata, click here. Read the full transcript of Sultan Nazrin’s keynote address. Asialink’s University of Melbourne Vice-Chancellor’s Fellow, Ali Moore, facilitated an ‘in conversation’ session with Professor the Hon Gareth Evans AC, QC, Chancellor of the Australian National University and former Australian Minister for Foreign Affairs, and Dr Mari Pangestu, former Indonesian Minister for Trade and Minister for Tourism and Creative Economy. The session explored ASEAN and Australian responses to the growth of China’s influence and identified opportunities for nuanced responses. 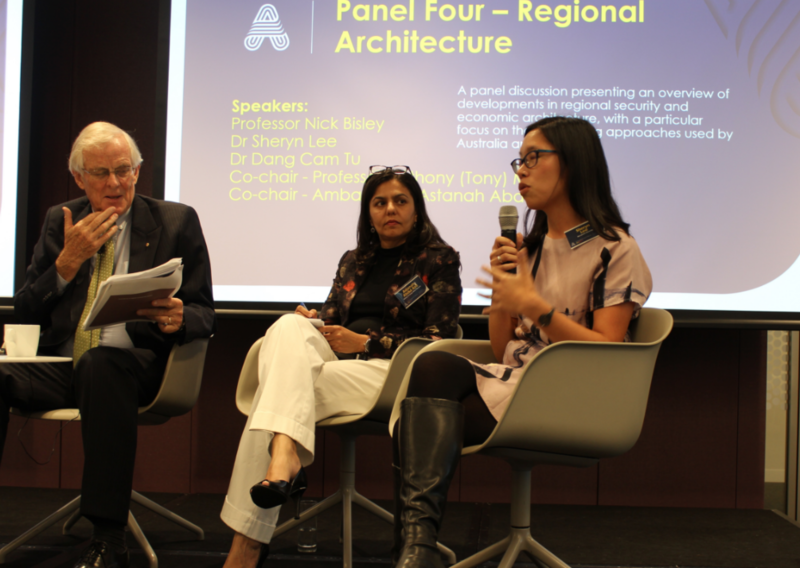 Asialink’s International Director, Professor Anthony Milner AM, co-chaired a session on ASEAN’s Regional Architecture, together with Her Excellency Ambassador Astanah Abdul Aziz, Malaysian Ambassador to Morocco. Panellists included Professor Nick Bisley, Executive Director at La Trobe Asia, Dr Sheryn Lee, Department of Security Studies and Criminology at Macquarie University and Dr Dang Cam Tu, Deputy Director General at Institute for Foreign Policy and Strategic Studies, Diplomatic Academy of Vietnam. The session provided an overview of developments in regional security and economic architecture and competing approaches (Australia in ASEAN, the East Asia Summit, security architecture including the ARF, ADMM-Plus and APEC). The question of what kind of institutional developments might help to deepen bilateral and multilateral cooperation between Australia and ASEAN was also asked. Asialink International Director, Professor Anthony Milner AM, is also Co-Chair (with Mr Ric Smith AO) of the Australian Committee of the Council for Security Cooperation in the Asia Pacific (AusCSCAP). With Mr Smith, he brought together ASEAN and Australian security specialists to discuss the current operations and future potential of the ARF. This seminar – held in cooperation with the Australian Institute of International Affairs – engaged many of the key ASEAN participants at the Dialogue of the previous day. These participants included Ambassador Ong Keng Yong, former Secretary-General of ASEAN, Ambassador Astanah Abdul Aziz, currently Malaysian Ambassador to Morocco, Mr Kavi Chongkittavorn, prominent Thai journalist, Dr Phillips Vermonte, Exec Director of CSIS, Indonesia, and Dr Dang Cam Tu, Deputy Director General, Institute for Policy and Strategic Studies, Vietnam. 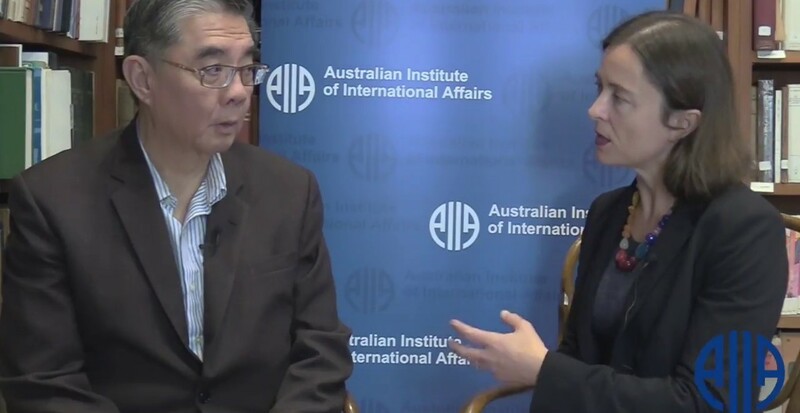 Ambassador Ong Keng Yong, former Secretary-General of ASEAN, being interviewed by AIIA National Director of Communications, Annabel McGilvray, following the seminar on the ASEAN Regional Forum. The important messages emerging out of the ASEAN-Australia Dialogue and the ASEAN-Australia Special Summit have been covered widely in the media following ASEAN-Australia Week. The following articles relate to Asialink’s specific contribution to these events.